The Hellknights are a brutal organization of warriors and spellcasters dedicated to maintaining law and order at any cost. For devil-blooded Jheraal, a veteran Hellknight investigator, even the harshest methods are justified if it means building a better world for her daughter. Yet things get personal when a serial killer starts targeting hellspawn like Jheraal and her child, somehow magically removing their hearts and trapping the victims in a state halfway between life and death. 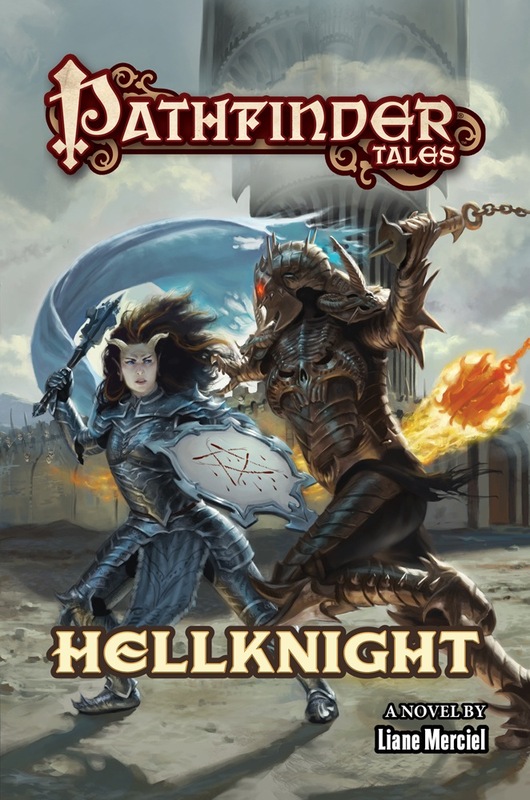 With other Hellknights implicated in the crime, Jheraal has no choice but to join forces with a noble paladin and a dangerously cunning diabolist to defeat an ancient enemy for whom even death is no deterrent. From celebrated dark fantasy author Liane Merciel comes an adventure of love, murder, and grudges from beyond the grave, set in the award-winning world of the Pathfinder Roleplaying Game. 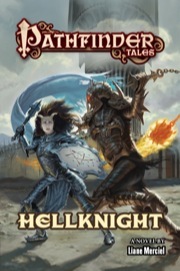 Hellknight is sanctioned for use in Pathfinder Society Roleplaying Guild. I fought the law, and, the law won! What do you get when you forge a party comprising a LG paladin, a LN Hellknight, and a LE diabolist? Three different interpretations of the power of Law. More importantly, you get a rollicking good time w/ great characters, villains, dialogue, and a strong vote for best supporting character (that would be the diabolist's companion, Vhaeros) in a PF book. Kudos on making us believe a star-crossed romance between the paladin and the diabolist could, maybe, possibly, work out. Some of the best dialogue in the book came from Velenne, in fact. Editing was very good; not a lot of noticeable errors at all. I would love a sequel to this book, w/ all 3 characters working together again (and Vhaeros makes 4). Also, a shout out to those in the acknowledgments who contributed towards the final product; thank you as well! I thought the action in this one was excellent. The character interactions between the paladin and his companions were interesting - but sometimes over the top. Some of the Hellknight principles and the eventual final setting were a bit Dragonlance-ish, but didn't detract from the flow of the book. A great and captivating story! My only quibble is the prologue. In my opinion, it gave away too much information, spoiling the whole murder mystery plot. If you enjoy a little mystery and haven't started reading yet, I would recommend skipping the prologue. A dark story of unlikely romance, murder, and an evil so heinous it was disavowed by Cheliax AND the Hellknight orders. Great stuff! Announced for April! Cover image and description are final. I presume it's set in Cheliax, somewhere? Don't know how recent, but I'm glad to see nook support. Yes indeed. Most of the story is set in Westcrown. With a single word title of such an iconic part of the Pathfinder Canon, and such a great writer on deck, my expectations are Sky High. A hellknight, a diabolist, and a paladin. Quite a team, that. Looking forward to it. A hellknight, a diabolist, and a paladin. Quite a team, that. One of the things I wanted to do in this book was pose one possible answer to the age-old question of "can a paladin team up with a known evildoer?" Like, forget about the conceal alignment or lie-to-the-paladin tricks. What happens if the evildoer is just straight-up "pleased to meet you, hope you guessed my name"? Ah, I love Westcrown! The story is intriguing as well. Just saw this. Dotting for later but I'm interested. Haven't been since ~June 2015 when distribution shifted to Tor books. Digital versions are available through most e-book channels. Will we also learn what happens when the hellknight, diabolist, and paladin walk into a bar? Two out of the three, anyway. The diabolist doesn't really do bars. Unless they're the kind of bars that have $15 cocktails with no fewer than three unpronounceable ingredients per drink. Because that right there, that is a Lawful Evil kind of bar. My only quibble is the prologue. In my opinion, it gave away too much information, spoiling the whole murder mystery plot. If you enjoy a little mystery and haven't started reading yet, I would recommend skipping the prologue. I'm wondering, what is the time frame of this book? Like, how long from start to finish in story line? One month, one year or another amount of time? It's a single summer, iirc about ten weeks from start to finish, not counting the epilogue. There are, or should be, enough context clues to figure out the exact number of weeks, but it's been a couple of years since I wrote the thing so I wouldn't want to try blind guessing it now. I e only recently started reading the book, so there's plenty more to enjoy in the book. So far, so good. Wow, just read this today and loved it. I had one question, though, about the very cool "dog", Vhaeros. I think he's an Eidolon. Yeah, an infernal eidolon seems likely, but only Liane Merciel knows for sure. I appreciate the feedback, but his master is not a summoner, but a diabolist. I admit I haven't looked at that class lately, but I don't believe they have access to eidolons. I'm starting to lean towards "unique fiend created by the author for plot purposes". Regardless, he was a cool addition to a great book. The diabolist in the book might not have taken levels in the Diabolist PrC. I really don't think he can be an eidolon. There are large swathes of the book in which he's in a completely different part of the city on his own and acting independently from his "master". I'm no expert, but I believe eidolons can't be too far away from their masters. The Unfetter spell would let an eidolon operate at any distance away from its summoner, but the master in this case has access to powerful sorcerer/wizard spells that are not on the summoner spell list. She is definitely a sorcerer or wizard and not a summoner. Don't forget that Summoners and their Eidolons have that matching rune on their foreheads. Aaaand since fiction can't use the OGL material and are therefore not bound by it, looking for close representation of game rules in fiction is somewhat futile.